The theme for the event was “Sweep sixteen," for the party's goal of sweeping conservatives into statewide office in the 2016 election. But the sweep started a little early. Incumbent GOP chair Will Deschamps of Missoula was up for a fourth two-year term. Behind the scenes some conservatives in the party wanted Deschamps replaced, blaming him for tolerating moderates who didn't stick to the party platform, like the handful of Republicans who helped Democrats pass Medicaid expansion in the 2015 legislature. There was little sign of this infighting on the convention floor, until delegate Tammy Hall of Bozeman took the podium to formally nominate Deschamps for another term. Veteran GOP lawmaker Jeff Essmann of Billings, one of Deschamps' challengers, echoed the theme of reducing conflict inside the party, though he described in a much more low-key fashion. “Instead of attempting to settle our differences behind closed doors, we are airing them on the opinion pages of the paper," Essmann charged. "Anger and finger pointing are counterproductive to our cause. Actions taken in anger rarely have good outcomes. The time has come for this to stop." The other challenger in the race, former Madison County Commissioner Dan Happel, focused on the need to stay true to conservative principles. 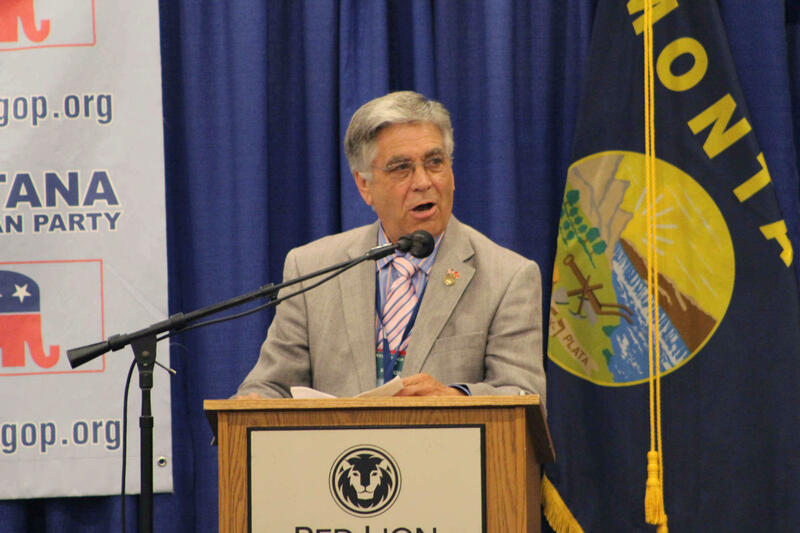 Deschamps, the incumbent, focused on his dedication to the party, and the success it's had under his leadership, regaining a Republican majority in the legislature, as well as sending a Republican senator and congressman to Washington in 2014. Once the speeches were over it was time for the more than 200 delegates to cast their ballots, a process complicated by a new rule approved earlier that afternoon: no one could be elected to a party post without getting an outright majority. The first round of ballots produced no clear winner but one loser: Will Deschamps was out. Deciding between Essmann and Happel took another half hour, for another round of ballots. Outside the meeting hall Essmann told reporters he preferred to look ahead to the 2016 election, instead of analyzing his defeat of the sitting party chairman. “The fact that we've got these statewide races on this ballot, meant that people really wanted to bring the party together to move forward and elect these Republicans," said Essmann. "My strength is in organization, and I believe that credibility will help me lead this party and serve this party." Before the convention, Will Deschamps had hoped to be re-elected on a ticket with Tammy Hall as his vice chair. Deschamps and Hall both lost their races, as the party picked Essmann and stuck with the incumbent vice chair, Senator Jennifer Fielder of Thompson Falls. Candidates for chairmanship of the Montana GOP outline their views. This weekend, the Montana Republican party will choose its leader, and chart the course for its future. 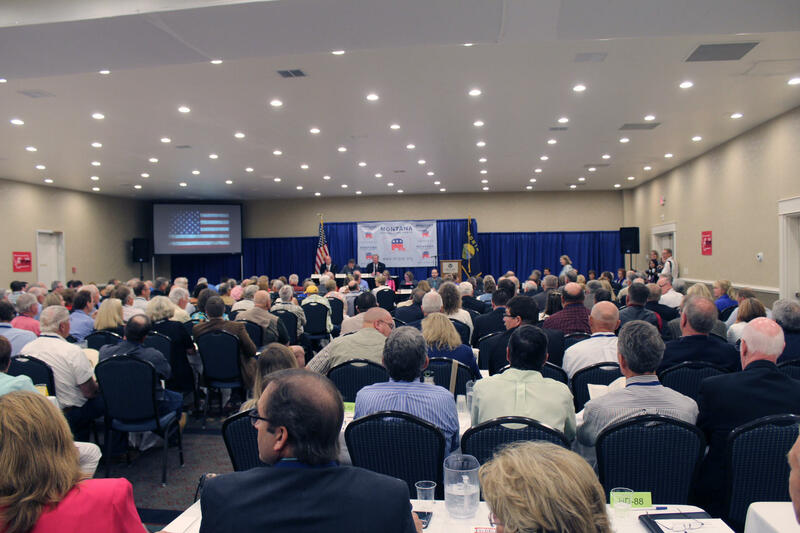 Delegates from all over the state are meeting today and tomorrow in Helena for their annual convention.